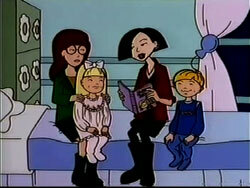 “Pinch Sitter” was the eighth episode of the first season of Daria. It first aired on MTV on June 9, 1997. "Pinch Sitter" was written by Anne D. Bernstein. At the beginning of the episode, during History class, Anthony DeMartino assigns homework regarding cults and the practice of brainwashing and mind control. Later that day, Quinn tries to rope nebbishy "nice guy" Ronnie into taking her babysitting job, so she can go on a date with another more popular boy, Skylar Feldman, but Ronnie sees right through her and refuses. Quinn then tries to convince her sister to do it. Daria first refuses, but quickly changes her mind when Helen asks both daughters to be in the house for Couples Therapy Night with her and a reluctant Jake. The babysitting clients are revealed to be the Guptys. Sensing the worst after a brief phone talk, Daria talks Jane into joining her later to help. Jane gives her some advice on how to deal with children. Meanwhile, Helen and Quinn attend a joint session with Helen’s Time Management consultant, Deena Decker, who lectures both on prioritizing tasks for a better time efficiency. She presents Quinn with a life planner (with the option of choice of a customized one, for a small fee, to Quinn’s delight). That night, Daria goes to her babysitting job. The Guptys are revealed to be an almost overbearingly sweet family of four: the parents, Lester and Lauren Gupty are nice, their children Tricia and Tad are well-behaved and respectful, have educational toys, were taught to discuss current events and learn new words before sleep, do not watch television (except for weather reports and business programs) and do not eat sweets. After some time with them, Daria is so desperate she calls Jane and begs her to come join her. 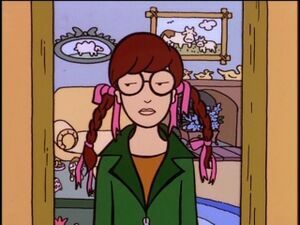 Daria, after allowing Tricia Gupty to brush her hair. Meanwhile, Quinn’s date with Skylar initially goes well, but her continued use of her evaluation date system (including a scheduled date with B.O.B., a Boy On a Bike she didn't catch the name of) and her refusal to go out steady with him eventually turn him away. Later that evening, Jane arrives at the Guptys. While there, both she and Daria start exposing both children to some subversive information: they tell them some some real-world facts, read slightly altered children stories, and basically teach them to think for themselves and not necessarily trust what grown-ups say. The four end up watching Sick, Sad World. In the end, Daria uses her babysitting experience to write her history paper (as a work regarding mind control deprogramming), to the delight and praise of Mr. DeMartino. "The original research," he tells Daria, "was thought-provoking, although it would probably be considered a FELONY in MOST STATES!!!" The Guptys would appear in episode I Loathe a Parade, especially Tad, who plays an important role during it. Tad's remark, "Hitler ate sugar", is an example of a form of association fallacy, reductio ad Hitlerum. TVTropes.com uses "Hitler ate sugar" as the trope name for any association fallacy found in artistic works. In Quinn's diary in "The Daria Diaries", we find she is dating Taylor in October. Quinn babysits a lot of families at this time: "The Daria Database" shows her spreadsheet to keep track of it and which families have the best TVs. Richard Lobinske merged the events of "Pinch Sitter" with "Too Cute" in the John Lane story "Sitting Cute". Wouter used Daria's babysitting job as a main plot in his Count Ickula story. "Children of the Scorn" by Kristen Bealer had Daria and Quinn unable to escape Couples Therapy Night, and are forced to interact with various kids dragged along. This page was last edited on 23 April 2018, at 14:09.